Your Pictures Of Roses Aren't Cutting It? Need A Little Help? ... pictures of roses have the highest vibrational energy of all of the flowers? 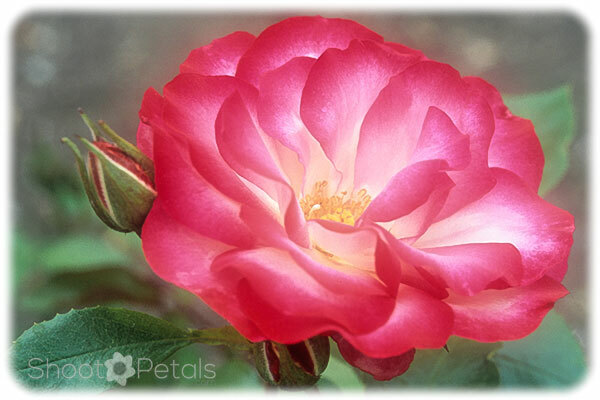 Roses produce the highest energy of the flowers and their aura glows, even in their portraits. Everything is energy... the roses, your cat and your dog and the sand on the beach. Roses are romance, compassion and all the highest levels of energy. That's why they're so loved and adored. Magnificent peach coloured tea rose and a bud in the rose garden at VanDusen Botanical Garden. A page from my 2016 calendar.. There are hundreds of different roses... the formal, elegant tea roses or the soft and gentle floribundas. Wild and free or well-bred and pruned, take your pick, they're magical subjects to photograph. Roses love the sunshine... but try catching them when there are clouds so there aren't any dark shadows. But, if there's a brilliant sun and you know how to manage your exposure... you've got an opportunity to practice getting some super pictures of roses with back lighting. You've got to understand light. It changes constantly... early in the morning, through the day and into the evening. Great light is the difference between a fabulous image you share with everyone and a ho-hum snapshot that just takes up file space on your computer! ... your cell phone might be all a rose needs! Picture of 3 roses at the Empress Hotel in Victoria. Taken with my iPhone 5s and edited in Snapseed. This photo of 3 dainty roses outside the Empress Hotel in Victoria will give you a new respect for your cell phone camera. It's the camera you always have with you. Take advantage of it! You'd be surprised at the quality images you can get from your cell phone. Go here to learn how to improve your iPhoneography. 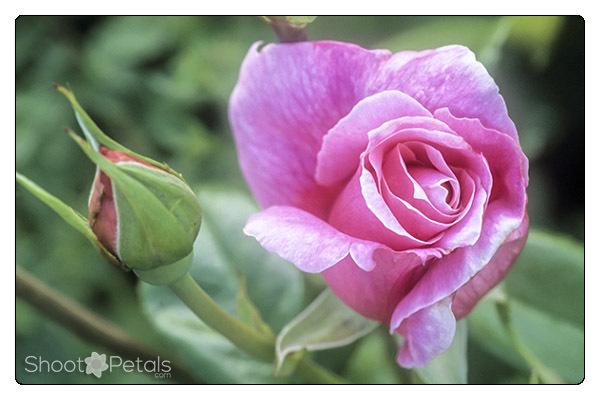 Here's a time saving tip... check the plants name tag when you're taking your rose photographs. Jot down the names in your notebook with the colour or photo number. Remember the Scout's motto - always be prepared! If you don't record the name, you'll regret it. Just ask me! Delicate yellow tea Rose Elina and bud at VanDusen Botanical Garden. The rose is in sharp focus and there is a shallow depth of field with some nice bokeh. This picture was taken early in the morning. The sky was overcast but bright... perfect filtered light and the perfect yellow roses for a note card! 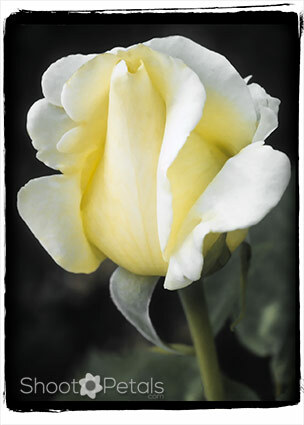 This is Rose Elina... a fragile, creamy-yellow rose and this image is from Van Dusen's Botanical Gardens in Vancouver, Canada. I was so proud of myself because one of my photography instructors pointed out that she could tell right away that this photograph was mine. Yes, finally, developing my unique style! That's a good thing! You'll notice that a lot of my flower photographs have a bloom and a bud that's out of focus in the background. Or that when I use textures, they all have the same "feel". Textures are my recent love affair. An old fashioned red and white rose, Hannah Gordon, glowing in the most beautiful soft, even light. It was slightly overcast but very bright. I love this light! I waited a little while for a cloud to cover the sun. Patience is a virtue when you're a photographer! Don't rush the process, slow down and get the best possible pictures of roses. Meet Hannah Gordon! An absolutely gorgeous bloom... in sharp focus and background blurred. But even though its focused, it still looks soft and dainty. Nothing steals your eye from Hannah because of the soft, gentle light on her petals and she almost entirely fills the frame. This pretty rose also lives in VanDusen Botanical Garden's formal rose garden. This rose garden gave me all 4 pictures of roses for my note card collection. They were all taken with 35 mm. slide film and then scanned. Pink tea rose and bud at VanDusen Botanical Garden. Both the bud and rose are in sharp focus and the pair fill the frame. The image is from a scanned slide. Here's a luscious "china pink" rose with a bud ready to pop out. The petals have an almost blue sheen to them. This particular rose always reminds me of the icing roses that are on the top of a birthday cake! It looks delicious, doesn't it? It was a bright, cloudy day and I was using a Nikon film camera. The bloom and the bud are clearly in focus but the background is blurred. Usually I blur the buds as well, but this one is on the same plane as the rose. It would be easy to blur the bud in a photo editor. 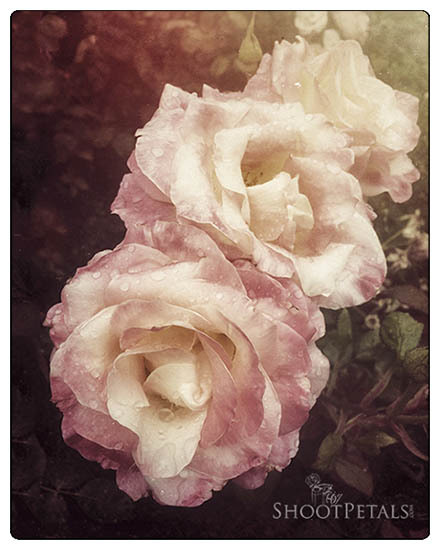 But I left this rose photograph realistic and only added a frame. If you have roses in your garden and you need information about growing them, here's the source for you! Check out Carol's web site if you want help caring for your roses. Then you'll only have to walk out to your own garden to get your pictures of roses. ... I can see right through you! Orange tea rose, Voodoo in the rose garden at VanDusen Botanical Garden. Delicate petals turn translucent when light falls on them from behind. If the sun insists on shining brightly, take advantage of it! Back lighting means you're shooting right into the sun. If you got a lens hood when you bought your lens, you'll be happy for it right now. If you don't have one, you can use a friend's hand above your lens... without getting a hand in the picture, obviously! If you have a tripod, it's easy to use your own hand to shade your lens. Basically, back lighting is when your subject is between you and the sun. If you use this kind of lighting situation, you'll get some beautiful translucent petals but the backside of the flower might be really dark. 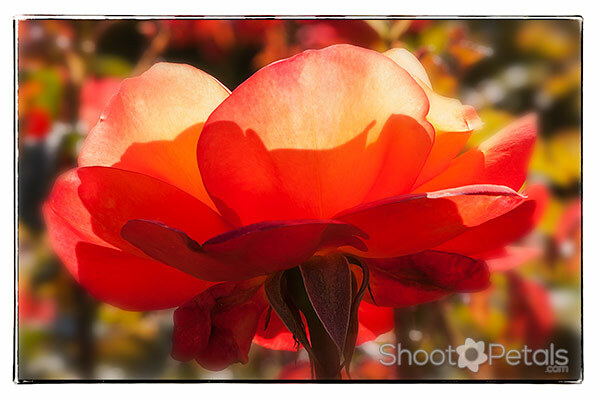 For better pictures of roses, use reflectors to bounce light into the dark areas. They come in small sizes, perfect for a single flower... and they fold up to fit into a small flat case that pops into your purse or your camera case. I'm never without them! Use the timer on the camera (or your remote) so the camera is still and hands are free to hold the reflectors. I used 30 seconds so there was plenty of time to get the reflectors in the correct position. With a point and shoot, you'll have to adjust your bracketed exposures yourself between each shot. Getting 3 shots gives you the best chance of getting the exposure nailed since this is a tricky lighting situation. Imagination and patience will ensure you get your desired pictures of roses. A deep, rich magenta coloured rose. So vibrant and strong and a great subject for photography. As a group, roses symbolize love. With good reason. They have vibrant auras, no matter what colour. Symbolically, their meaning changes according to their colour... which also changes whether the colour is light or dark. Culturally, meanings change... also from year to year. It gets even weirder... putting different flowers together in a bouquet changes everything again. Now it becomes a complete message, like sending a letter! Yes, it gets complicated... if you put in a couple too many stems, you'll be sending a message you didn't mean to. But I prefer to keep things simple! So let's make this as easy as possible and leave the bouquet issue alone.... which was REALLY in vogue in Britain and on "the Continent" in the 1800 and 1900's. There are many color symbols in my pictures of roses. Turn them into wallpaper for your computer monitor. Have you checked out my flower wallpapers? Download the latest one for your iPad or cell phone. Or use your pictures as a screensaver. 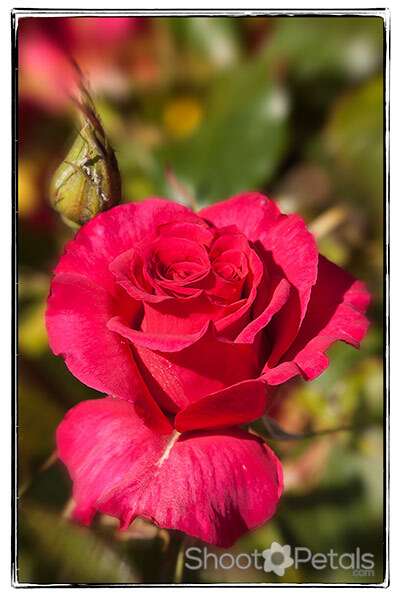 The 3 rose photos you saw above on a solid coloured background could be the beginnings of a business card. Photos on plain backgrounds are also great for note cards - for the same reason... you can put your own message on them. Just use your photo editing software. On Mothers Day, I sent off some gorgeous floral note cards for gifts. A present with a personal touch! Practice taking pictures of roses on white or neutral backgrounds. Open the file in your photo editing program, resize it to the size of your note card... then type in your message. Now you just have to print it on your card stock. So, give your technical know-how a tune-up, put your creative eye into gear, and be patient. Wait for the right light and your perfect rose blossom. You'll know you've got the right one when you feel a connection with it. 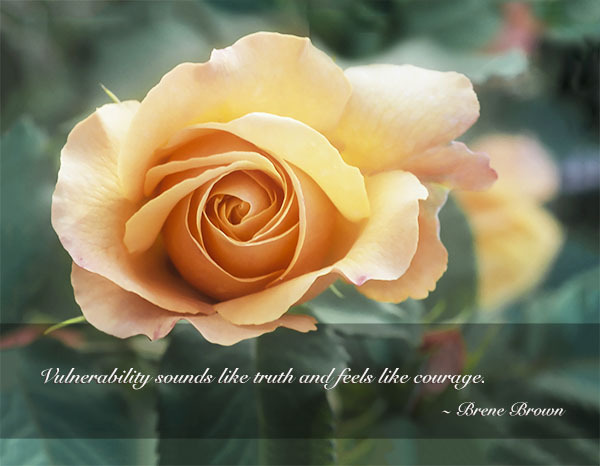 The rose's energy will speak to you! 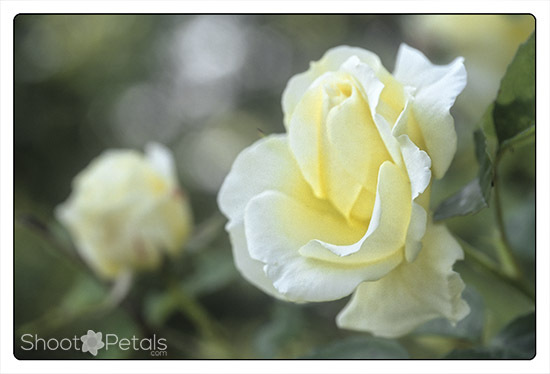 Dainty light yellow tea rose on black background and a little green foliage. The last of my pictures of roses is a light yellow tea rose... she brings a sweet message of friendship. So, on that note, make sure all your bouquets send the proper message.